We understand that since the photographs shown on this page were taken, the castle has been fenced off as unsafe. This is sad, but perhaps not surprising: its state when we visited was reflected in the warnings we offer below. The rest of this page remains as written before castle was fenced off, to allow virtual visitors a better view than is now possible on the ground. 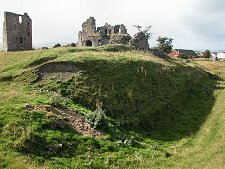 The remains of Sanquhar Castle lie on the southern edge of the town of Sanquhar, a couple of hundred yards south west of the A76 and close to a residential street. 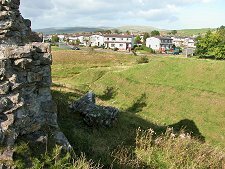 You can see the castle from the main road, and the ruins are also passed by the Southern Upland Way long distance path en route into the town. 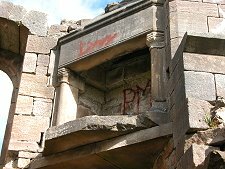 Sanquhar Castle is a sad and neglected place, but also a strangely fascinating one. There are no direction signs showing you how to get there, and no information on view once you arrive. Some of the stonework seems only vaguely attached to the rest, and what looks like fresh rubble suggests that bits do fall off from time to time. 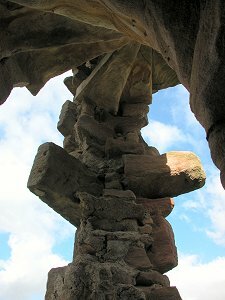 There are also a number of unprotected precipices, especially near the spiral staircase in the keep. All this is a long-winded way of saying that if you do visit Sanquhar Castle, take extreme care. 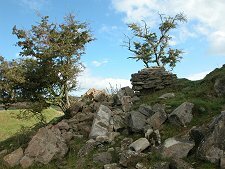 Our advice would be to view the remains from a slight distance and avoid climbing into or onto anything. 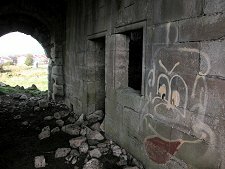 On the other hand, the discarded lager cans around the site look to be crushed by human hand rather than falling stonework, and graffiti artists have managed to reach even the highest levels of the inside of the keep, presumably without fatal consequences or it would have been in the news. And there are all too obvious signs that the gateway and rooms in the north range are sometimes used as a sheep pen, again without any suggestion that the sheep involved have suffered as a result. 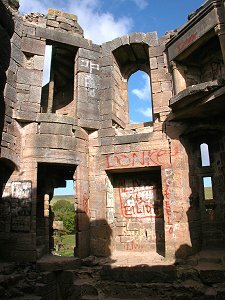 Scotland has no shortage of neglected ruins, but Sanquhar Castle is especially sad because it has the potential to become so much more than it is today. There's a lot more left above ground than you'll find at many castles, and to judge by the bumps and hollows, still more of it is waiting to be unearthed. 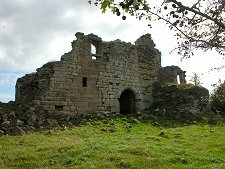 Sanquhar Castle was built by the Crichton family from about 1400. They chose a strong location, with ground falling steeply to the River Nith to the west and the Townfoot Burn to the north. The natural defences were supplemented by a ditch cut around the east and south of the site. This remains impressively deep on the eastern side of the castle. 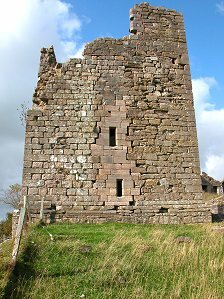 The castle that gradually emerged over the following two hundred years comprised a rectangular curtain wall, within which were four ranges of buildings. To the north of the main castle was a walled outer courtyard which would have contained service buildings. At the south west corner of the castle was a four storey keep that contained the Crichtons' private rooms. This is where James VI would probably have stayed when he visited Sanquhar Castle in 1617. In 1639 the Crichtons, by then the Earls of Dumfries, sold the property to Sir William Douglas of Drumlanrig, who later became the 1st Duke of Queensberry. He later built Drumlanrig Castle a few miles away as a much grander residence for his family. 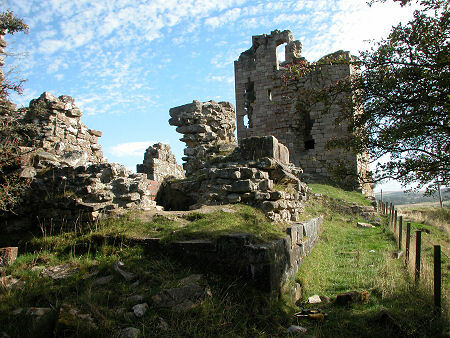 But after spending just one night in his new home Sir William returned to Sanquhar Castle, where he lived for the rest of his life. After his death the family moved to Drumlanrig and left Sanquhar Castle to begin its slow decline. 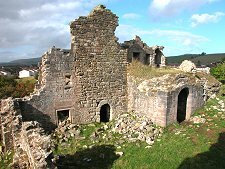 In 1895 John Crichton-Stewart, the 3rd Marquess of Bute, acquired Sanquhar Castle and began work intended to restore his ancestral home to its former glory. The work ceased on his death in 1900 and what remains today is a peculiar mixture of original stonework and restoration, all overlain by the effects of a further century of decay. 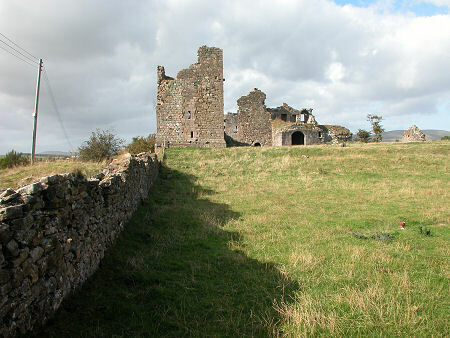 If you visit Sanquhar Castle when the wind is whistling in from the lonely uplands to the west, be alert for odd noises. It may just be another discarded lager can bouncing off a fallen piece of stonework. Or it might be the ghost of Marion of Dalpeddar, the flaxen haired young woman who disappeared in 1590, allegedly murdered by one of the Crichtons.